Tales from a tribble: The Two Best Performances Ever of The National Anthem? Update - Make That Three! The Two Best Performances Ever of The National Anthem? Update - Make That Three! Years ago I published [and then repeated about a year ago] what I thought were the two best performances of the National Anthem that have been performed before a nation wide audience at a big sporting event. I mentioned two because these two performances stood out far and above all other performances I have heard. These were two beautiful heart felt renditions of our national anthem. Well I must repeat this post with an update on Feb. 4, 2019 after hearing Grammy Award winning, "Empress of Soul", Gladys Knight, perform a truly beautiful rendition of the National Anthem in her home town of Atlanta, GA in the Super Bowl LIII. 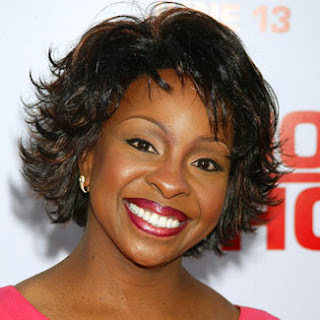 Below is my post I published earlier, with an update at the bottom with Gladys Knight's awesome performance. 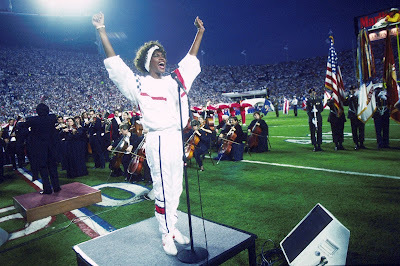 I think many people will agree with me that the best singing of the National Anthem at the Superbowl was by Whitney Houston in 1991 at Superbowl XXV. 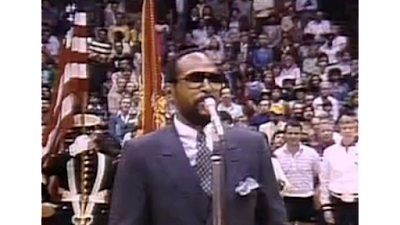 I feel that outside the Superbowl the best performance of the national anthem was sung by Marvin Gaye at the 1983 NBA All Star game. What an unbelievably beautiful voice and what a stirring rendition of the National Anthem by Marvin Gaye. So, here they are, in my opinion, the two best performances of the Star Spangled Banner. Prepare to get goose bumps. It is sad these two great patriots have left us at a much too young time in their life. I can say I feel blessed to have lived during a time to witness and hear their God given beautiful voices. May they both be resting in peace with the Lord. UPDATE: Feb. 4, 2019: Well let's make that three! Yes, I am now adding Gladys Knight's rendition of the National Anthem in yesterday's Super Bowl in Atlanta, GA, along with Marvin Gaye's and Whitney Houston's performances, to make it in the top three of all time, IMHO. Note: This is from NFL films and you must click where it says "on You Tube" to view. Brava!, Gladys Knight and Whitney Houston, and Bravo!, Marvin Gaye. both of those are riveting, gotta love the smooth poetic and beautiful delivery of mr. gay!! !